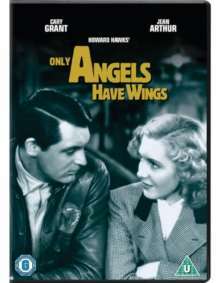 Der Artikel Only Angels Have Wings (1939) (UK Import mit deutscher Tonspur) wurde in den Warenkorb gelegt. Cary Grant, Jean Arthur and Rita Hayworth star in this classic drama directed by Howard Hawks. As the San Luis ship docks into the port of Barranca to deliver supplies, cabaret singer Bonnie Lee (Arthur) seizes the opportunity to take a look around. While exploring the town she meets a group of American pilots who risk their lives on a daily basis to fly cargo planes over the Andes. As Bonnie gets to know pilot Geoff (Grant) and sparks between them fly, Geoff faces the difficult decision of whether to commit to his new love, giving up his one passion in life: his job. Lexikon des Int. Films: "Effektvoller Abenteuerfilm mit typischen Hawks-Ingredienzen, packend durch Action, Atmosphäre und eine Reihe attraktiver Stars."